A quesadilla made with three flour tortillas stacked with beans, sour cream, cheese, tomatoes and fresh avocados. Triple decker, triple delicious. Top 1 tortilla with layers of half each of the beans, sour cream, cheddar, tomatoes and avocados; cover with second tortilla. Cook in medium nonstick skillet on medium heat 1 min. or until heated through. 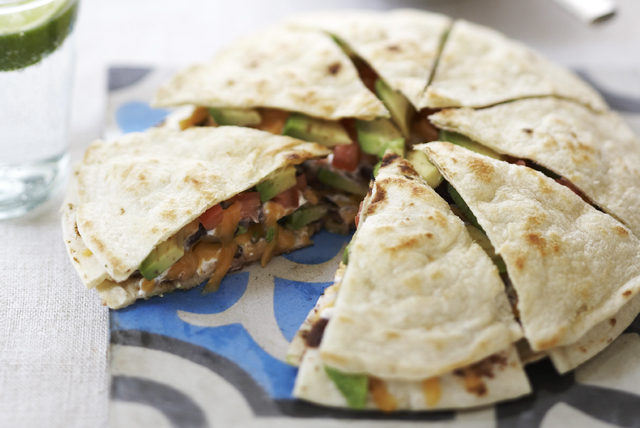 Turn quesadilla over carefully; top with layers of remaining beans, sour cream, cheddar, tomatoes and avocados. Cover with remaining tortilla. Cook 1 min. Carefully turn quesadilla over. Cook 3 to 4 min. or until cheese is melted and bottom of quesadilla is golden brown. Remove from skillet; cut into wedges. Prepare using KRAFT 2% Milk Shredded Mild Cheddar Cheese, and BREAKSTONE'S Reduced Fat or KNUDSEN Light Sour Cream. Prepare using your favorite variety of KRAFT Mexican Style Shredded Cheese. Substitute pico de gallo for the tomatoes.